My daughter, Svara, is 7 years old. She has been joining me at quilling since she was four, but has only in the past several months started enthusiastically making designs of her own. She is even asking me to share them on the blog! So periodically I will share some of her designs she has proudly made and photographed. 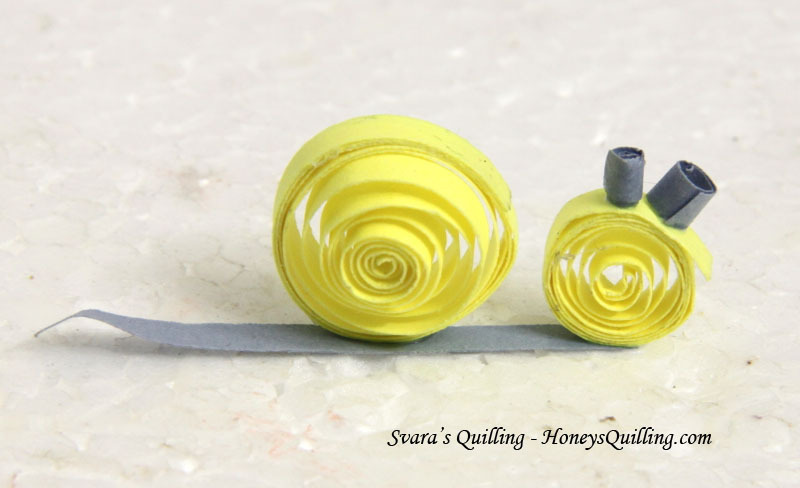 Earlier in the year she helped with one quilling tutorial for kids and she has plans for many more tutorials! Since I like to make quilled jewelry, Svara is also interested in making her own designs. These pendants were designs of her own that she thought up and made all by herself. The last design here is the middle and one petal of a flower – she was experimenting with gluing two strips of paper together to make a petal. Here is Svara at work! She does her quilling on a small wooden folding table near my quilling desk. Like any quiller, she enjoys trying out new tools! On this day she was trying out the mini mold ! (click here for some tips on using a border buddy!) she was so excited and wanted to be the first to try! Lastly, for today, here is a snail she made the other day. I thought this was so cute and createive – it sticks up from the board like it’s a real snail just crawling along. The antennae are adorable! I’ll be back soon with more of Svara’s work and hopefully a kid’s tutorial as well. Just today she was working on making a little crab.